Something radically different gets new meaning to hand held objects for all things digital as seen in this amazing video where... you can "reach inside" a computer screen and manipulate objects as if they were real. Haptics writ large without question. Being Digital = Google Glass - the first truly wearable computer. 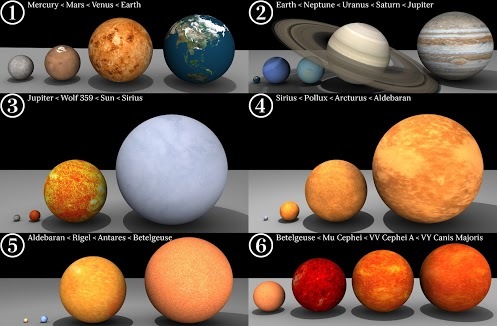 Great pix from Lov Lothra showing comparative sizes of celestial objects. 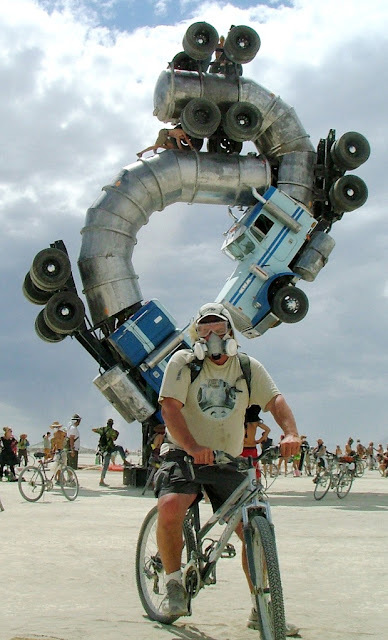 A must read from Smart Planet, America’s oil choice: Pay up, or get off piece, written by Chris Nader, reminds me of the Cheshire Cat telling Alice how to "get there'. The oil industry has an important message for you, America: You’re not paying enough for fuel. And if you want to realize the fantasy of “North American energy independence,” you will have to pay more for it — a lot more. Getting drivers to go along with this notion will not be easy, so the industry has couched this message in much more careful language. In other words, North American oil prices need to be higher. And the way to do that is to export crude to the rest of the world. So let me guess. In order to keep the drilling, fracking and ongoing stripping of the Bakkan oil sands to continue, with disastrous environmental impact in hand, we have to export the toxic sludge, Dibit, under high pressure and high temperature from Canada through the US via the proposed XL pipeline for delivery to the wold in order to A. incur higher oil prices to continue doing the same old drilling, fracking and stripping and B. continue our dependence on fossil fuels supplied by foreign entities, right? So I agree with Rühl, van der Hoeven and the experts cited by the Times: Crude prices would have to rise for the boom in unconventional oil and gas to continue. Their production growth has already slowed as prices have faltered. But I disagree that the answer is to open up U.S. ports to crude oil exports. This isn’t really a principled argument about misalignment between resources and regulations, or open trade policy. It’s a strategic choice about whether or not the United States wants to remain committed to oil. Instead of asking ourselves if we want more oil from increasingly dirty and environmentally damaging sources, we should be asking what kind of an economy we want. End Gerrymandering as this insures that incumbents remain in power. Amendment 28 whereby Congress must obey the laws it passes, terms limits and the elimination of lobbyists funneling money to the politicos in order fro them to get reelected, something not the case today. Kill the Fed, the US had a revolution over the control of money, something we don't have as a cartel protected by government controls our money, not us. Demand transparency in finance and governance We don't have that, thus we are being compromised without question. Institue public financing of campaigns and eliminate Citizens United as the last time yours truly checked, IBM is not a person. Eliminate the IRS and the byzantine tax codes (20,000 pages & counting) enabling the upper 1% to game the system. Replace it with something comprehensible and fair as the IRS works for the Fed to collect the interest on the money, our money, the Fed borrows in order to buy US Treasuries. We must make these changes and then some before it's too late as earth is sending us a wake up call to change our ways or face the consequences, something we continue to ignore at our peril. Arctic sea ice volume has declined by 36 per cent in the autumn and 9 per cent in the winter between 2003 and 2012, a UK-led team of scientists has discovered…. "Other people had argued that 75 to 80 percent ice volume loss was too aggressive. What this new paper shows is that our ice loss estimates may have been too conservative, and that the recent decline is possibly more rapid." Any questions? 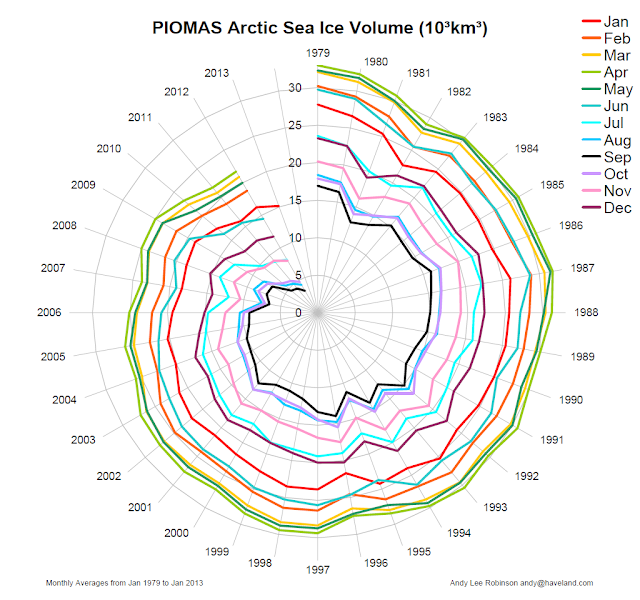 Seen below is a death spiral depicting the decline of arctic sea ice from 1979 to the present or.. ."something wicked this way comes." The holy grail of solar is to capture the complete wavelength of light generated by the sun, something not readily achievable until now. 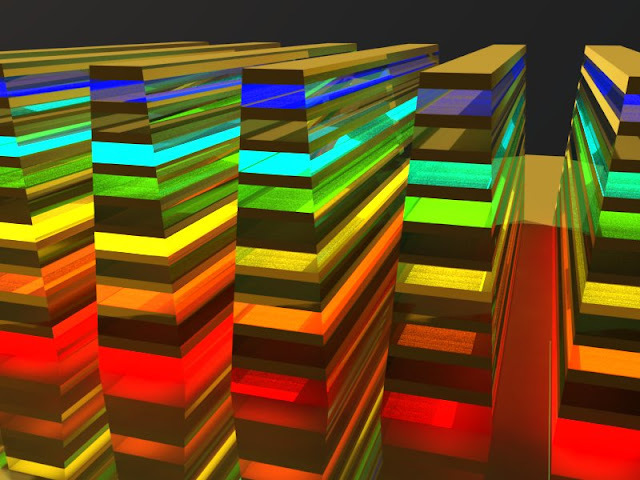 They developed a "hyperbolic metamaterial waveguide," which is essentially an advanced microchip made of alternate ultra-thin films of metal and semiconductors and/or insulators. The waveguide halts and ultimately absorbs each frequency of light, at slightly different places in a vertical direction, to catch a "rainbow" of wavelengths. Gan is a researcher within UB's new Center of Excellence in Materials Informatics. "Electromagnetic absorbers have been studied for many years, especially for military radar systems," Gan said. "Right now, researchers are developing compact light absorbers based on optically thick semiconductors or carbon nanotubes. However, it is still challenging to realize the perfect absorber in ultra-thin films with tunable absorption band. "We are developing ultra-thin films that will slow the light and therefore allow much more efficient absorption, which will address the long existing challenge." Carver Mead, the inventor of VLSI, pioneered this approach in developing the Foeveon chip to capture light by using an RGB arrangement in a chip used in Sigma Cameras for high end digital photography. The Foveon X3 sensoris a CMOS image sensor for digital cameras, designed by Foveon, Inc. (now part of Sigma Corporation) and manufactured by National Semiconductor and Dongbu Electronics. It uses an array of photosites, each of which consists of three vertically stacked photodiodes, organized in a two-dimensional grid. Each of the three stacked photodiodes responds to different wavelengths of light, i.e., each has a different spectral sensitivity curve. This difference is due to the fact that different wavelengths of light penetrate silicon to different depths. The signals from the three photodiodes are then processed, resulting in data that provides the three additive primary colors, red, green, and blue. When filming Finding Nemo, yours truly realized yet again, just how insignificant we are in the face of reality and the power of nature. Something to consider don't you think? Tech of a different sort. Welcome to RIOT, a new and better way for uninvited others to spy on you, me and anyone else who uses social media. Being an avid photographer and now videographer, yours truly has used Nikon equipment for over 40 years. (OMG!) With the advent of cameras now accepting old glass like Nikkors, Zeiss etcl, etc., the joy of using exquisite tech like that of Nikon continues unabated. To that end, here is a wonderful video commemorating 80 years of excellence in showing how Nikon makes their masterpieces. As old timers say, tech like this never dies. Enjoy. "Observable consequences of the hypothesis that the observed universe is a numerical simulation performed on a cubic space-time lattice or grid are explored. 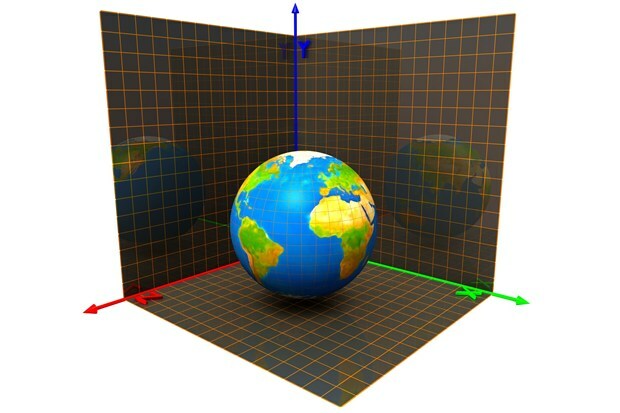 The simulation scenario is first motivated by extrapolating current trends in computational resource requirements for lattice QCD into the future. Using the historical development of lattice gauge theory technology as a guide, we assume that our universe is an early numerical simulation with unimproved Wilson fermion discretization and investigate potentially-observable consequences." In other words, the possibility of the Matrix being real is possible but...on a much vaster scale. The idea that we might be living in an artificial reality constructed by something higher than ourselves has been a recurring philosophical hypothesis for centuries. Plato's Allegory of the Cave, Descartes' evil demon, Putnam's brain in a vat -- these are all variants of justifications for solipsism, a philosophical idea that says it's impossible to know with any certainty whether the world as we experience it is "real" or a simulation projected by some external entity. Keanu Reeves' character Neo in The Matrix opts for a dose of reality when he chooses to take the red pill, but figuring out whether our universe is "real" or not is a touch more complicated than that. The notion of reality being a simulation is not that startling when John Wheelers's from It to Bit concept is factored into the equation, something BRT has discussed on numerous occasions including Message in a Bottle, a piece incorporating Wheeler's notion that the universe is an information engine along with Seth Lloyd's brilliant take on quantum computing, a device far more powerful then a mere breaker of cryptographic codes residing on the net. 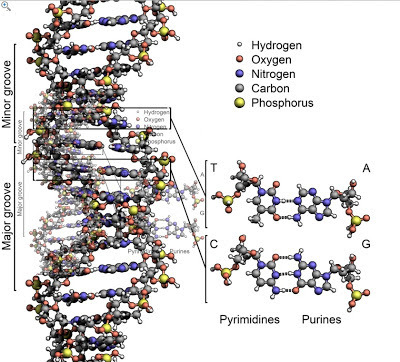 Another aspect of existence most interesting is the fact everything can be digitized and that life, at it's very core, is a 4 part digital environment as DNA consists of 4 nucleotides, (guanine, adenine, thymine, and cytosine) recorded using the letters G, A, T, and C and are always paired as ATCG without exception. effectively "froze" the advancement date of the public domain in the United States for works covered by the older fixed term copyright rules. Under this Act, additional works made in 1923 or afterwards that were still protected by copyright in 1998 will not enter the public domain until 2019 or afterward (depending on the date of the product) unless the owner of the copyright releases them into the public domain prior to that. This not withstanding, a move by a Maryland school board stating they own student's work under the rubric of copyright goes beyond the pale. “Works created by employees and/or students specifically for use by the Prince George’s County Public Schools or a specific school or department within PGCPS, are properties of the Board of Education even if created on the employee’s or student’s time and with use of their materials. 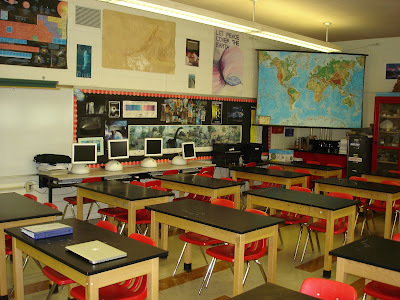 The school board states it is merely spelling out the terms of existing federal copyright laws, specifically Copyright Act of 1976, the Digital Millennium Copyright Act of 1998, and the Technology, Education, and Copyright Harmonization (TEACH) Act of 2002. Yours truly videotaped a meeting about the 2nd Amendment with local state reps. One topic NOT discussed during the talk was the issue of the 3D printing of guns etc., etc., and the impact it's beginning to have on all things relating to the 2nd Amendment but rather about how to establish "intelligent" guidelines regarding background checks (obviously), safe storage and whether the government intends to take away guns from law abiding citizens. (NOT). After the discussion, one participant, when asked about the emerging tech of printing gun and what it means to the 2nd Amendment, responded, with complete confidence that... "The 3D printing of guns is a non issue and besides, we're on the downward side of this." But, for argument's sake, check out the little number seen above showing a micro flying machine that didn't exist a month ago. Interesting, don't you think? Arrogance and the profound lack of understanding of just how disruptive tech truly is vis a via politicos is simply astounding but maybe the video seen below might shake things up a bit as 3D printers, properly configured, can print just about anything, including this little essential needed to add a little oomph to your beloved AR 15. The only thing missing from printing the entire gun is the barrel, a little something that's about 2 or 3 months away, given just how fast 3D stereolith printing is progressing. Addendum - 3D printed Stem Cells have joined the party as well.